Published in 2009 by Doubleday. Everyone thinks it was because of the snow. And in a way, I suppose that's true. This is one of those books that makes you stand back, look around you and take in everything you have. It is the type of book that makes you thank your lucky stars that you are alive. 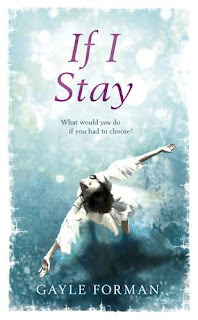 If I Stay is the story of Mia, a seventeen year old girl, with a loving family, friends who care about her and a drop dead gorgeous boyfriend. Her future looks bright, as it looks like she will be accepted to play the cello at Juillard. Mia has so much to live for and so much hope for a successful career. But life can change in an instant. The story starts on a cold and snowy February morning, when life is put on hold for the whole family when a snow day is declared. A road trip is decided on the spur of the moment and all at once Mia's life changes for ever. Her previous decisions no longer seem important as Mia has to make the most important choice of her life. If you haven't guessed it already, Mia's life hangs in the balance after a fatal car crash that kills the rest of her family instantly. Mia spends the entire book watching the world from outside her body, trying to decide whether she wants to stay alive or whether she wants to join her family in death. Normally you would think, there would be no question as to your answer in a decision like that, but as Mia has lost all her family and is the only one left, you can see how this decision would indeed be a difficult one to make. The remaining family she has and her ever adoring boyfriend spend hours trying to talk her out of her coma and it is so heartbreaking to read. I really believed in Mia, I understood her weaknesses and was in awe of her strength to deal with the death of her family. She really is an amazing character. The book takes you back and forth between the present and the past, giving you a real feel for Mia's life. Music plays a central role throughout the book, her father was a musician and her boyfriend plays in a band, as well as Mia's own musical talents with the cello. I loved this book, even though the story line is really sad and I felt quite choked reading it, I was completely addicted to it and finished it in one session. It is definitely one of those refreshing reads that will stand out in your memory for a long while after. It amazes me the quality of some of the YA books being published recently. I have found them to be more powerful reads than the ones written for grownups. Anyone else feel like that? You must read If I Stay, though do have a box of Kleenex nearby to mop up the tears. This book really made me appreciate what I have. Life is very delicate and I think many of us take it for granted. So, I definitely believe that you should live life for today, let tomorrow's worries take care of themselves. Go out and do something spontaneous today! Other reviews of this book. I read If I Stay in Norwegian in August, I absolutely loved it! I didn't think the book was all sad, Gayle Forman used a lot of warmth and humor as well so I actually didn't cry all that much. This definitely sounds like a heart-wrenching read, but wow, it sounds good! *crossing fingers that library has it* Thanks Vivienne...beautiful, beautiful review! Wonderful review! I don’t know if I could read this book now (it’s too sad; pregnant women = too emotional), but it definitely sounds like a great and impressive book. You’re right, sometimes, we take life for granted, but life is too short, so we have to live it to the fullest! I skipped the spoilers part too, but I read enough to be convinced that this is not a book to be missed. And yes - I love YA and definitely see no difference in terms of qualify, complexity and depth between it and adult fiction. The book does sound really sad, but good. I love books that evoke emotions! I didnt read the whole review because of the spoiler, but this one does sound good. I'm adding it to my TBR. Wonderful review Viv, I loved, loved, loved this book, the tears trickled and I laughed too, definitely a must-read. Loved this book, glad you read it. I was going to tell you the part that had me sobbing the most, but as most of your other commenters haven't read it, I won't. I love books like this, Viv! Such meaningful read. I get odd looks from the teens sometimes when I'm browsing through the YA books. :) I agree that there is some quality writing there. I still haven't had the chance to read this book, but it's on my list. This sounds like an absolutely heartbreaking story. I think I am going to have to put this one off. Great review, though, Vivienne.